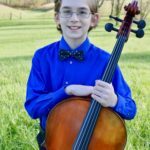 Joshua Kováč, 10, from Jonesborough, TN, began his formal cello studies at the age of four as a Suzuki student of Jean Dexter. He currently studies with professor Daniel Veis from Park University in Kansas City. At the age of 7, Joshua won 1st place and received the Laureate title at the ProBohemia International Competition in Ostrava, Czech Republic and 2nd place at the Heran International Cello Competition in Ústí nad Orlicí, Czech Republic. During the year of 2016 Joshua won several competitions with performances at the Weill Recital Hall at Carnegie Hall and Merkin Recital Hall in New York City. He received a 1st prize at the American Protégé competition, 1st prize at the International Grande Music Competition and 2nd place at the International Virtuoso Competition. Joshua performed as a soloist with the Kinnor Philharmonic and ETSU Chamber Orchestra and had masterclasses with Gilbert Kalish, Matt Haimovitz, Keith Robinson, Ivan Chen and members of the Lestrange Viols. Joshua has participated in several summer music festivals: Music@Menlo Festival, National Cello Institute in Claremont, CA, Heartland Chamber Music Festival in Kansas City and Ottawa Suzuki Institute in Kansas. In 2015, Joshua had the honor of performing for both the Czech and Slovak Ambassadors to the United States in Kansas City at the home of Benny and Edith Lee. He is currently a member of ETSU pre-college Chamber Music Program and ETSU Chamber Orchestra. Among other interests, Joshua enjoys science, composing, playing chess, solving rubik’s cube, reading and skiing.